Phillip von Haesler, Marilyn Villalba, and Eddie Zamora, directors of the program Juvenile Hall Retention Program (JHRP), work with youth eight to eighteen years old at Juvenile Hall in Eureka. Their 27 volunteers branch off into groups of nine to do service three times a week. In the short hour that volunteers get to spend with participants during recreation hour, they manage to do everything from play board games to basketball. Marilyn, volunteer for a semester and director for two, recounts many touching moments during her involvement in JHRP. One of these moments surrounds a young girl curious about why JHRP came to spend time with them. ‘Do you get paid?’, ‘Is this credit for a class?’, these are some of the questions she asked only to receive an unexpected response, “We just want to be here”, Marilyn had told her. The participant seemed surprised and expressed her appreciation to the volunteers, “That was the first time we had ever heard that it made a difference for them”, Marilyn stated. JHRP witnessed a specific young girl who created a bond with a law enforcement officer in Juvenile Hall, “he took her under his wing”, said Marilyn. After all her adversity she has become determined to become part of the FBI or local law enforcement. She does not look at her future with limited scope, she now knows with confidence her potential because she was offered support instead of a label. 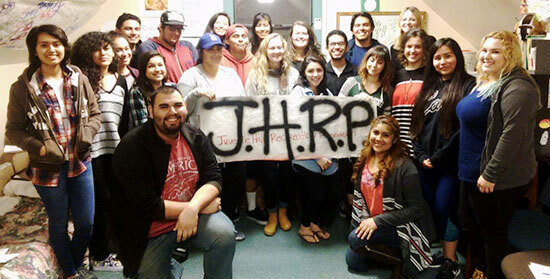 “JHRP reinforces the concept that the kids aren’t bad people [and]...to trust others that are interested in the best for them”, Marilyn states. It’s difficult for kids in Juvenile Hall to redeem themselves from societal judgements and expectations, but with the right support they are able to succeed and thrive. Majority of participants, despite being grouped into a bad kid cycle, have expressed interest in attending HSU or CR, or colleges outside of Humboldt County in the future. “...sure enough we have bad times, bad weeks, bad days...but they have it worse, and it feels good to make a difference in someone’s life...it makes us feel better at the end of the day...no matter what mood we go into the hall with we come out with a better one at the end of the day”, says Marilyn.